Do you want to lose weight, build muscle, or feel more fit? Join Beachbody On Demand, and get unlimited access to Beachbody’s world-famous programs, including 21 Day FIX®, CORE DE FORCE®, and P90X®. Don’t miss out on your chance for amazing results. Sign up today! Foam rolling has become the golden child of muscle relief. Walk into a big box gym and you’ll see people doing foam rolling exercises, or attend a group fitness class and you might use foam rollers before the warmup. Some studios even offer entire foam rolling classes. This increasing knowledge and use of foam rollers is great, but it can make us forget about another important element of fitness—stretching. Both have benefits and both should be part of your routine. Adding foam rolling and stretching exercises to your schedule may seem like a lot, given that it’s hard to do even a 30-minute workout most days. But thanks to the many benefits of foam rolling and stretching, doing both can give your body and workouts a boost, provided you do them at the right times. The primary benefit of foam rolling is to alleviate tension in the muscle tissue. “If you have any little restrictions like scar tissue, fascia, or trigger points, regular self-myofascial release can help release those adhesions and soften the tissue,” explains Debra Stroiney, Ph.D., professor of sport and exercise science at Gannon University. Foam rolling does this, in part, by increasing blood flow to the area you are rolling. “When you roll your muscles, you are pushing blood away, and then after it wants to rush in,” says David Behm, Ph.D., university research professor, applied neuromuscular physiologist, and sports scientist at Memorial University of Newfoundland. The combination of relieving tension and increasing blood flow provides benefits both before and after a workout. So grab your favorite foam roller, whether that’s a rumble roller or a foam roller, and get started! Not exactly sure how to foam roll? Follow this guide for a break down of how to use a foam roller, and how not to use a foam roller. Foam rolling during a warmup literally warms up your muscles because of the increased blood flow. 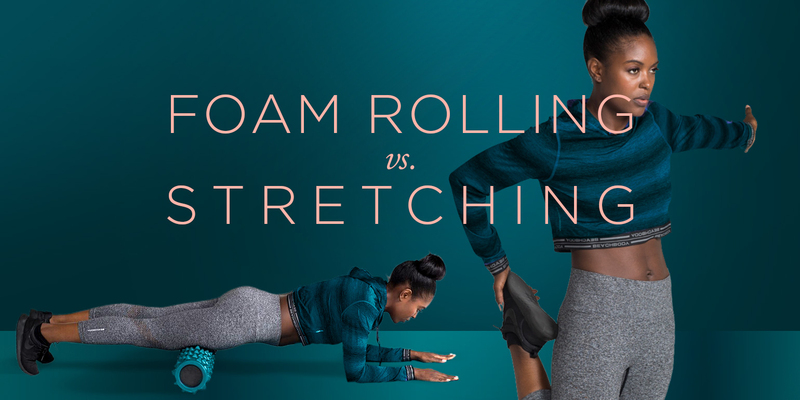 “Foam rolling is a whole-body thing,” Stroiney says, which prepares you for your workout. Additionally, research shows that foam rolling for as little as five to 10 seconds increases range of motion, though rolling for longer leads to greater benefits. Plus, it provides these benefits without affecting performance during your workout, whereas static stretching before a workout can actually decrease power or performance, Behm explains. And, despite the “hurts so good” reputation foam rolling has, it doesn’t need to hurt. On a scale of one to 10, where one is no discomfort at all, and 10 is severe discomfort, rolling at an intensity of seven out of 10 gives the same benefits as rolling at an intensity of nine, Behm says.“You can roll moderately and still get the same effects,” he says. Stroiney recommends doing five to 10 minutes of foam rolling as part of your warmup. Behm says rolling an area for 30 to 60 seconds is best, but listen to your body. If an area needs extra attention, focus on that and roll it longer. This may also help reduce the risk of injury, especially if you tend to have tight muscles or trigger points, providing release will help your muscles function better, she adds. When you foam roll as part of a cooldown, take more time than the pre-workout foam rolling. Stroiney suggests dedicating one to two minutes to roll out each muscle group you used. “Think of it like if a professional massage therapist were doing a full-body release for you,” she says. “You are just doing a smaller piece of that.” Look at a massage therapist like a dentist, and foam rolling is like brushing your teeth. It’s a preventative task, and more convenient than a massage, which unfortunately doesn’t always fit your schedule and budget. Foam rolling isn’t only for the days you exercise. It’s also great to do on rest days. “Doing it on a daily basis isn’t going to hurt you. If anything, the people I know have felt better because of it,” Stroiney says. Since the increasing blood flow can help your muscles recover, it can be a huge for your recovery days. The only time you may not want to foam roll is if you are injured. You could do more damage, so check with your health care provider before rolling an area that’s in pain. The benefits of foam rolling and stretching overlap a bit, but the primary goals are different. 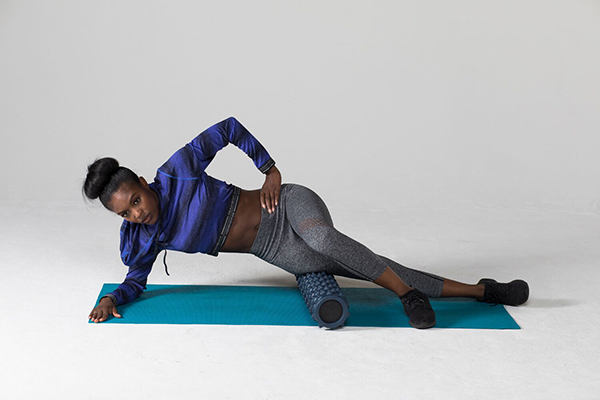 “Whereas foam rolling is intended to release and regenerate the fascia and underlying muscles, stretching focuses on improving range of motion by specifically addressing tissue extensibility, training the body for the controlled elongation of muscles during movement,” explains Jessica Matthews, author of Stretching to Stay Young and senior adviser for health and fitness education for the American Council on Exercise. In turn, stretching exercises lead to increased flexibility which may reduce your risk of injuries. “When you are better able to go through a full range of motion as your body is intended to, that leads to better movement patterns and quality, both during workouts and in everyday life,” Matthews says. Stretching can be confusing, however, because there are two kinds of stretching exercises: dynamic and static. Dynamic stretching takes your joints and muscles through a full range of motion, such as trunk rotations, arm circles, and hip circles. Static stretching is passively holding a stretch. Each provides different benefits and is best performed at different times of your workout. The intention of a warmup is to gradually prepare your body for the exercise that’s to follow. Because of this, dynamic stretching is most ideal pre-workout to increase your body temperature and heart rate. They can mimic movements or exercises in your workouts, Matthew says, like the standing hip hinge (pushing your hips back) as preparation for squats. This helps to prepare your nervous system and gets your brain-body connection going. Dynamic stretches should also stretch your muscles through movement, such as leg swings for the hamstrings, or walking quad stretches. And studies show dynamic stretching is better than static before a workout to boost power, anaerobic performance, and acceleration and speed. Static stretching does the opposite. Research has shown that doing static stretches before a workout may reduce muscle strength by 24 percent and muscle endurance by 28 percent and also reduce jump performance and decrease speed. Before a workout, five to 10 minutes of dynamic stretching is ideal, but as little as three minutes will do the trick, Matthews says. You should always do dynamic stretches for your ankles, hips, shoulders, and thoracic spine, as these areas are designed to be really mobile. Then, do movements specific to your workout. Think: Are there “rehearsal” movements you can do at half-depth and slower speed? After a workout is when static stretching comes into play. Your body is warm and your muscles are more pliable, which is an ideal situation for static stretching. The American College of Sports Medicine (ACSM) advises holding each stretch 10 to 30 seconds. Then, repeat it until you’ve held each stretch for an accumulated 60 seconds. That can seem like an eternity, so to make this easier, Matthews suggests using your breath. “Fifteen seconds is about five to six slow, controlled breaths,” she says. Move into your stretch and hold that position to the point of mild tension or slight discomfort for at least five breaths. Then repeat this four times. Aim for 10 minutes of post-workout static stretching of all your major muscle groups, Matthews recommends. If that’s too much, “even one 15-second rep [per major muscle group] is better than zero,” Matthews adds. Naturally, hit the muscles you’ve just worked, but also think about what else you do throughout the day that could potentially create stiffness, impact your posture, and affect your movement quality. Stretch those areas too, such as the hip flexors, which tend to be tight since we all spend so much time sitting. As a bonus, this can be very relaxing. “Static stretching can help alleviate physical tightness in the body, and pairing it with mindful breathing can help decrease psychological stress too,” Matthews says. As with foam rolling, stretching shouldn’t be something you only do on workout days. The ACSM recommends stretching at least two to three days a week. Dynamic stretching is great to do in the morning to prep your body into the day, or anytime of day to re-energize, Matthews says. Get up from your desk and do a few stretches during the afternoon to bust you out of your lull. Foam rolling and stretching are great alone, and they also make a great couple—if you have time, of course. In a small study published in the International Journal of Sports Physical Therapy, adolescent athletes did foam rolling, static stretching, or foam rolling followed by static stretching. All three techniques increased ankle mobility, but combining the two lead to a greater effect. Similarly, a study by U.S. researchers of 40 adults found that doing both led to greater increases in range of motion in the hips. If you decide to do both, follow the study protocols and foam roll before stretching. If you’re short on time, experts say to foam roll before your workout, focusing on particularly tight and tense areas of your body. Then post-workout, do static stretches since your core body temperature is increased and your muscles are warm. And if you’re ambitious, try foam rolling later in the evening, say when you’re Netflixing. If you have time to do both before and after exercise, follow this formula: Pre-workout, roll tight or restricted areas to prep your body for the greater movements you’ll do in your dynamic stretches, Matthews recommends. Post-workout, foam rolling first, as it will help you stretch further in your static stretches. There are benefits to foam rolling and stretching, and while it’s ideal to combine the two, you can often get by doing just one. You can roll at anytime of day, and will get the benefits before or after exercise. As for stretches, do dynamic stretches before a workout (ideally after foam rolling), and static stretches after a workout (again, ideally after foam rolling). By working these into your fitness schedule and your everyday routines, and chances are you see and feel a difference in your muscles and movement, inside and outside the gyms. Kale and collard greens, teff and eggs pack a punch of nutrition to start your day. With all the rainy weather this summer, there is an upside – lots of dark leafy greens. My son is doing his masters in agriculture at Guelph and his hobby garden in our back yard is my paradise. Dino (laminate) kale, red kale and curly kale, swiss chard and beet greens deck my plate at least three times a day, in some way. This morning I though maybe I’d steam some greens and have them with my eggs, but I also really feel like have a warm waffle with a little maple syrup. Ideas merged and here is the recipe. It actually tastes pretty good (! ), even if the waffles do look green. Pour wet with dry and stir well. Heat up waffle grill and oil it up (I used olive oil). Pour some batter on and bake until waffles are crispy and slight brown on the outside. Eat right away with a little maple syrup, or some fresh berries. Sometimes I will mix a cup of thawed frozen blueberries with 1tbsp or two of chia seeds and a 1/2c hot water and stir. Let it sit for a few minutes to gel up and it makes a lovely sugar free topping. Store extra waffles in glass container in fridge or freezer for easy toaster warm up on another morning. Teff is high in iron and calcium, dark leafy greens have iron, calcium and a ton of phytonutrients, almond milk has added calcium, eggs have B12 and protein (as does the quinoa flour). From the heart and kitchen of Dr. Laura M, Brown, ND.